You had the opportunity to purchase something historic. For the first time Marvel reprinted a Golden Age Captain America story. 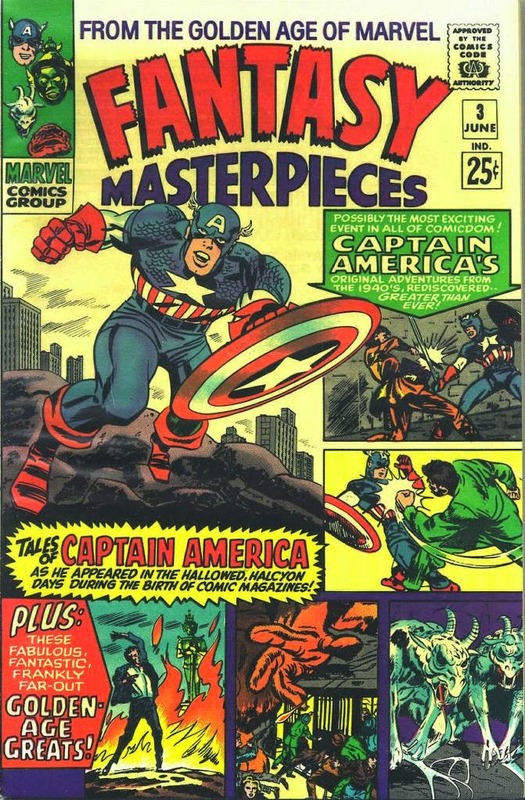 Actually they reprinted two Cap stories from 1941, both penciled by Kirby but finished by a different inker. The 17 page "Hunchback of Hollywood and the Movie Murder" was finished by Frank Giacoia. Reed Crandall applied his considerable embellishing skills to the 11 page "The Plundering Butterfly and the Ancient Mummies"
FANTASY MASTERPIECES #3 also had another treat for connoisseurs of comparative Kirby collaborations - a 13 page Kirby/Ayers giant monster story.